When it comes to dissecting LEGO Worlds’ DNA, the ever-popular Minecraft is the obvious benefactor. Scratch the surface just a little and you’ll find a less obvious influence: 2016’s still frequently discussed No Man’s Sky. Like Hello Games’ space tourist sim, LEGO Worlds has a similar focus on exploration and discovery, complete with a busted spacecraft that must be upgraded to reach further flung parts of the galaxy. The tutorial is set over a trio of themed worlds with narration provided by the ever-charismatic Peter Serafinowicz. Over the space of a couple of hours a variety of tools are slowly added to the inventory, with each tutorial mission based around using a shiny new plaything. Build a house, paint a tower, etc. It’s clear a lot of effort has been spent here to avoid overwhelming young minds, as plenty of time is given to acquaint with each tool before introducing the next. Unlike the rest of the galaxy the three opening worlds aren’t randomly generated, and so it’s only here that a ‘personal touch is present. This is something that’s notably missing once the tutorial is out of the way, so enjoy it while it lasts. While touring the plastic landscapes new items, animals, characters, and structures can be discovered and added to the ever-growing list of things that can be plonked just about anywhere. 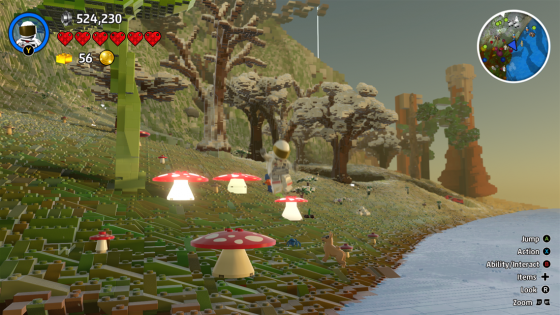 In a nutshell, that’s LEGO Worlds’ discovery aspect. Coming across a new vehicle, especially something like a helicopter or a terrain destroying digger, is often wondrous. Discovering a new kind of wildflower, tree stump or rock formation; less so. As for exploration, the ultimate goal is to collect 100 gold bricks in order to become a Master Builder. Each world contains several of these elusive bricks, either as quest rewards or hidden inside the treasure chests found underground or on top of tall structures. Glowing beacons indicate where quests and chests are located, so there’s always something, or somewhere, of interest to visit. Twenty-two different biomes feature, each with their own unique items and quests. While this may sound like an impressive amount, many are just slight variations of the same theme: lots of forests, woodlands and meadows with varying flora and fauna, and a few desolate sand-covered realms including safari and Egyptian biomes. Large worlds often feature more than one biome in addition to underground caverns and oceans filled with sea life. Bustling towns and monster-filled dungeons, sometimes too, with the latter putting the weapons often found in treasure chests to good use. 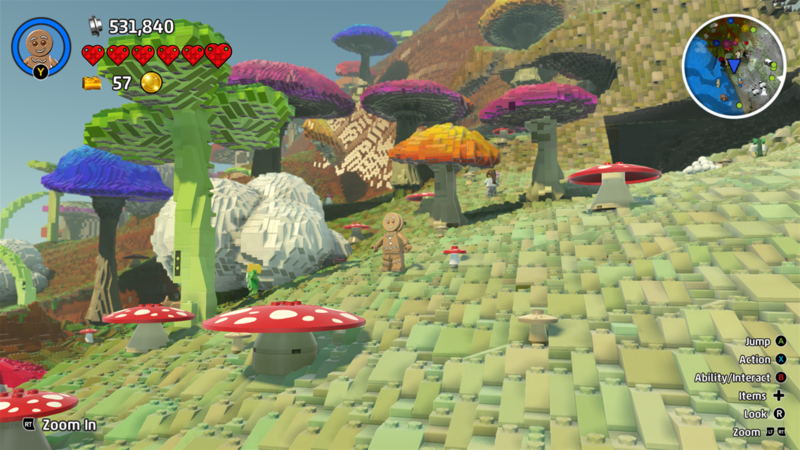 For the first few hours, LEGO Worlds genuinely feels magical. There’s some impressive tech on display, allowing entire landscapes to be destroyed and reshaped. LEGO diehards will be in their element too, as the lack of licensed material has prompted a raid on the LEGO brick archives with items taken from such forgotten lines as Pharaoh’s Quest and Monster Fighters. LEGO Dino Hunt (aka LEGO Dino 2010) successfully fills in for the LEGO Jurassic World license, meanwhile. As time passes the magic starts to wane, and like No Man’s Sky before it, it’s not long until new worlds start to look barely any different from the last. The ‘personal touch’ the opening worlds possessed is sorely missed, with the random generator sometimes placing quest givers or important items in precarious places. Having to destroy terrain to reach a treasure chest isn’t uncommon – if a chest is partly obscured then the button prompt to open it won’t appear. It’s extremely annoying. It also certainly doesn’t help that missions start to repeat and grow tedious quickly. Every Wild West world has a cowpoke or two in need of a hand with finishing their new barn, or a mission to round up their lost cattle. Every animal has a fetch quest that can be completed in mere seconds if that item (a shiny green apple, usually) is already in the inventory. Photo quests aren’t any more demanding, as it’s often possible just to build or place whatever item the person requests a snap of, rather than scout for it. By the time we had reached the sixty gold brick mark it had come to the point where we were ignoring missions and just ravaging landscapes for their resources – leaving a path of destruction in our wake – before heading to the next world to do the same. By this time the random generation algorithms became plain to see, so to speak, with worlds throwing up fewer and fewer surprises. And so it falls onto the creation aspect to hold long term interest. 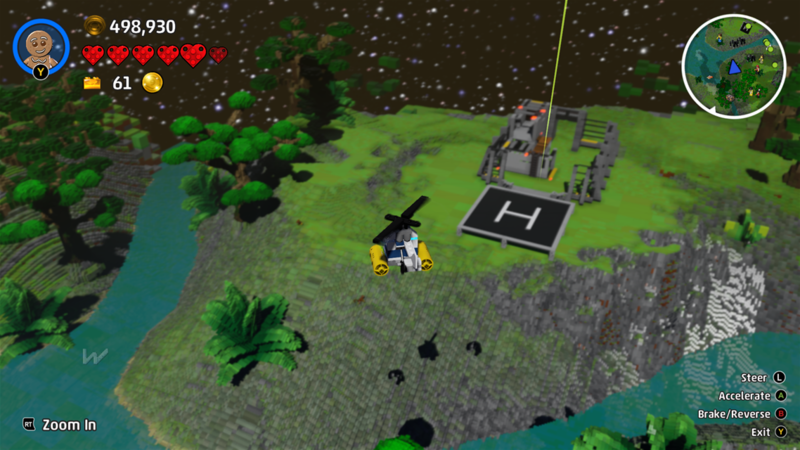 Fortunately, this is where LEGO Worlds excels. The toolset is far more varied and versatile than Minecraft (ignoring the fact that all block types must be discovered first) as control shifts to a cursor interface. The camera is easy to adjust as well, making it possible to zoom in and out at will. Start painting the landscape and character control becomes automated, with your chosen LEGO person leaping all over the place while coating bricks and buildings with pretty colours from afar. Blueprints can be saved, structures cut and pasted, and buildings made brick by brick by using the freehand tool. It’s even possible to sample colours from elsewhere in the landscape when painting. 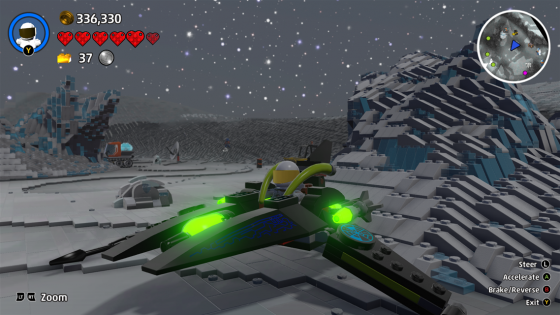 It’s easy to become infatuated with LEGO Worlds’ scope and potential for construction. Indeed, it’s not hard at all to imagine younger gamers spending their evenings – maybe even entire weekends – planning and building their own fantasy realms with a friend in tow (LEGO Worlds supports co-op play, parents will doubtlessly be pleased to hear). It’s just a shame that the exploration and discovery aspects, which were intended to prevent direct comparison with Minecraft, feel a little undernourished. But at £20, you’ll be pushed hard to find another game offering an equal amount of value for money. It’s a small price to pay for potentially 100s of hours of entertainment, an overactive imagination permitting.